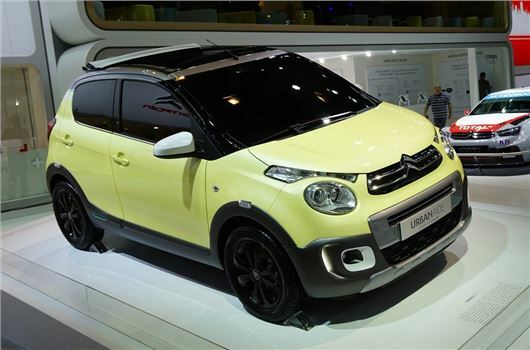 Citroen has shown off a higher-riding crossover version of the C1 at the 2014 Paris Motor Show. The slightly wider C1 variant rides 15mm higher than a standard C1 and has restyled front and rear bumpers for a more purposeful look. The car was shown in hard-top and fabric-top body styles, making it an ideal rival for the recently launched Vauxhall Adam Rocks and Adam Rocks Air. The C1 Urban Ride is not confirmed for production, but visitors to the show will be able to cast a vote. If there is enough demand then Citroen will put it into production. If it does go on sale then expect it to sit at the top of the C1 range with a price of around £12,500.